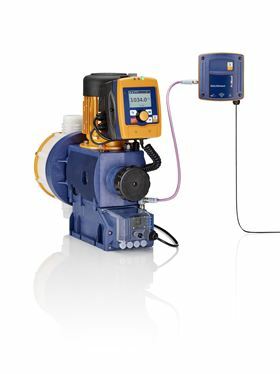 The motor-driven metering pump Sigma X Control type with a new operating unit and DULCOnnex offer an intelligent solution for digitally linking system components. At this year’s Hannover Messe, which runs from 1-5 April, ProMinent will focus on its web-based products for metering and process technology. One of those products is the DulconneX gateway for digital fluid management. Combining the solenoid-driven metering pumps gamma/ X and gamma/ XL with the DulconneX gateway allows users to monitor, analyse, and optimise processes. Digital networking means that all the necessary information is available for optimum system control. A cross-section of the Orlita Evolution will also be show, demonstrating design solutions which compensate for leaks and protect against overheating as well as warning of diaphragm ruptures and safeguarding against overpressure. Also at the ProMinent stand will be the new peristaltic metering pump Dulcoflex Control, which has an intuitive user interface with clickwheel operation. The dosing head which has been developed by ProMinent is designed for quick and simple replacement of the hose with an exchange technique which doesn’t require a tool. The peristaltic pump is highly suited to metering highly gaseous, high-viscosity, abrasive, shear-sensitive and chemically aggressive fluids. The ProMinent team will be available at Hall 15 Pump Plaza, stand G43.02 at Hannover Messe.